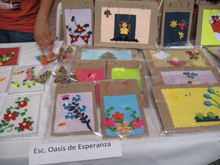 Oasis de Esperanza has a Manual Arts class for some of our older students. It’s a combination manual arts/entrepreneurial class for young people to learn about starting and managing a small business. Every November, the American/Nicaraguan Chamber of Commerce and other businesses in Nicaragua host and sponsor a Crafts Fair competition that encompasses Manual Arts type class in schools throughout Nicaragua. Three years ago, Oasis de Esperanza won the inaugural competition and won a laptop computer, cell phone, and other prizes. Two years ago, we should have won but didn’t so last November, the young people came back with a resolve to win again … and they did!! Oasis de Esperanza competed and won first place in competition with 40+ schools and organizations. Again the first place award was a laptop computer, school supplies and library books. At the awards ceremony our teacher and students first recognized and gave the glory to God for their success, a great witness for the Kingdom and for the school. It’s such an encouragement for our kids, who for the most part have never competed, much less won any kind of competition. Winning and the excitement of competing and winning only motivates them to defend their title in 2013! So proud of them!